Last week I once again pointed to the problems associated with using annualized GDP growth numbers instead of annual numbers. The article I discussed was penned by Cato Institute Senior Fellow Michael Tanner, a sharp guy who writes well and is almost always right on the mark (and he wrote a stellar foreword to my book Industrial Poverty - his contribution alone is worth the book's price). The other day someone sent me a link to Tanner's article, drawing on his numbers to make a policy point. This motivated me to revisit the issue. Tanner's article is actually a good platform for doing so, not to pick on a good friend, but because it was published in the USA Today. As exemplified by the email I got, the misinterpretation of GDP numbers reaches a wide audience. As I will explain below, this can have substantial consequences, beyond what many people seem to realize. 4. We now multiply this rate by four, to simulate a growth rate for four consecutive quarters. Now we have the annualized growth rate, which is 4.2 percent. The only problem is that contrary to what a lot of people believe - apparently my good friend Michael Tanner among them - this is not the annual growth rate. It is the growth rate in one quarter. 1. Inflation-adjusted GDP in any quarter is compared to inflation-adjusted GDP in the same quarter a year earlier. In the fourth quarter of 1993, at the end of Bill Clinton's first year in office, annualized growth was 5.6 percent. Annual growth, on the other hand, was 2.6 percent. On five occasions during his presidency, the annualized growth rate exceeded six percent, adjusted for inflation. In Q4 of 1999 it even reached seven percent, a seemingly astounding number for a modern, industrialized economy with a maturing welfare state. Yet the annual growth rate was "only" 4.8 percent in that quarter. Still an impressive number, and Clinton was the last chief executive to date to preside over 4+ percent growth. Annual growth, not annualized. But it was not seven percent. To flip the coin, in the first two quarters of 1995, annualized growth was 1.4 and 1.2 percent, respectively. For a full six months it looked like the Clinton economy was grinding to a halt. Yet the annual figures, 3.5 and 2.4, respectively, showed an economy that was humming along. Annual growth were 3.1 and 2.4 percent. Perhaps the most striking difference is for Q4 of 2008, when annualized growth showed an economy in absolute free-fall at -8.4 percent. If this number was misconstrued as an actual, annual growth rate, it would display a macroeconomic disaster of Greek proportions. It could easily suggest that Congress must take panic-mode measures to prevent a macroeconomic calamity. As we know from the European experience, when governments go into panic mode, very bad things happen. In reality, the situation was serious but nowhere near catastrophic: annual growth was -2.8 percent, a number that is expectable at the beginning of a sharp downturn in the business cycle. Imagine the difference if the annualized number had played a role in a presidential election. In this particular case it did not, but there is nothing to say that it cannot happen when, for example, Trump is up for re-election, or there is a pivotal midterm election pending. 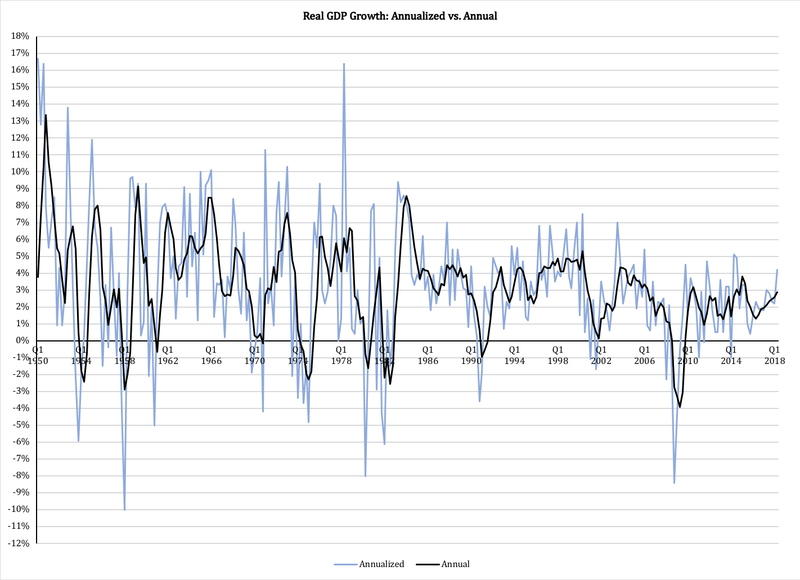 Over the longer period of time, annualized growth converges to annual growth. This is trivial from a statistical viewpoint, but it is worth noting nonetheless. Annualized numbers really only tell us about the volatility in growth; if volatility is high, it means that there is something wrong with our industrial structure or - more likely in a modern welfare state - that government policies have a distortionary effect on the economy. 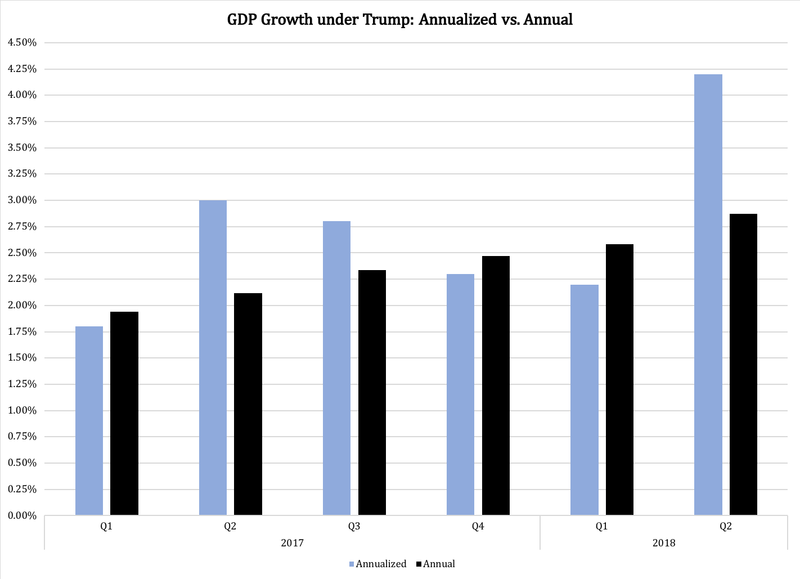 The spike in growth in Q2 2018 is actually a good example: while it is wrong to call the Trump tax cuts "distortionary" - they were after all good for the economy - it is likely that they are the primary explaining variable behind the spike in Q2 growth. As a last point, it might be worth noting that annual growth in Q1 2018 was 0.4 percentage points higher than annualized growth. If we use annualized growth for Q2 to pat Trump on the back (to be clear, Michael Tanner does not do that, but others have been quick to use it for that purpose) then should they not also bow their heads in sorrow over the slow economy just one quarter earlier? That is all for now on national accounts and economic growth. I am sure we will have reasons to return to this subject later, but for now: enjoy the first week of the last quarter of 2018!